Dublin's plan for a landmark civic space in the heart of the capital has been rejected. Permission to develop a €10m College Green plaza has been refused by An Bord Pleanála amid concern about "significant negative impacts" on traffic movements across the city. While the planning appeals board acknowledged there was merit in the proposal, it said there was not enough information about the impact the project would have on traffic. It found that plans to reroute buses along the quays were not appropriate, and that there were "unresolved capacity issues". It also raised concerns about the capacity of existing footpaths on the quays to accommodate increased numbers of pedestrians when bus services were rerouted. As a result, it said, "the proposed development would give rise to significant adverse impacts on pedestrians and on bus transport within the city centre" and would therefore be "contrary to the proper planning and sustainable development of the area". The €10m project was unveiled by Dublin City Council in 2016 and included a pedestrianised space on Dame Street in front of Trinity College of more than 7,000 square metres, which would be paved and include high-quality street furniture. 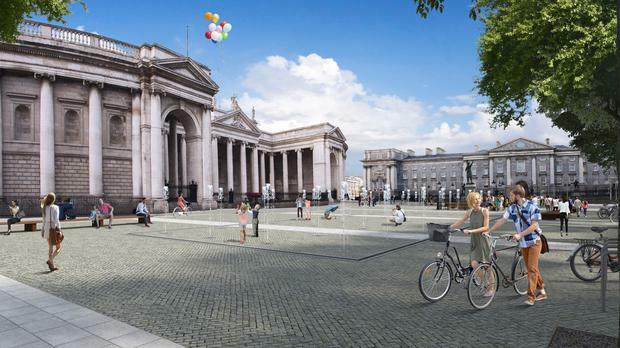 The plan was to allow trams, buses, taxis and cyclists to travel north-south in front of Trinity, with the rest of College Green pedestrianised. More than 90 objections, many focused on access to the city centre and wider traffic concerns, were made. Dublin Bus also flagged concerns, saying it would have to alter 30 routes but said diversions would be acceptable if it had access to Parliament Street for north-south movements. Dublin City Council said it noted the decision, and would not be in a position to comment until it had reviewed the report in detail. The National Transport Authority said the decision was "disappointing", while in a tweet, Taoiseach Leo Varadkar said he hoped the council could develop a revised proposal. But business group Dublin Chamber said that while it was not surprised by the decision, planners should go back to the drawing board. Head of public affairs Graeme McQueen said the chamber was supportive of the concept, but not convinced by the plans given the lack of detailed traffic analysis. "We remain supportive of more pedestrianised areas in Dublin. We absolutely need them. But increased public transport investment and proper planning is required to allow for that to be possible," he said. The Green Party said it was "dismayed" at the decision, with cyclists and pedestrians "ignored" as the city was "slowly but surely strangled by traffic". The board found the impacts of the scheme were "positive" for the Luas but "negative" for general traffic, buses, taxis and access. There were also "unacceptable" safety concerns for cyclists and pedestrians.